For the 2018/2019 season practices are 11:30am - 12:30pm on Saturdays afternoon. Practices are on the events calendar. Artistic gymnastics is a discipline of gymnastics where gymnasts perform short routines (ranging from approximately 30 to 90 seconds) on different apparatus, with less time for vaulting. In an all-around competition, athletes must compete at the same level in all events. At the Program level, an artistic gymnast specializing in fewer events than the all-around total may compete on two different levels, with a one-level difference between. 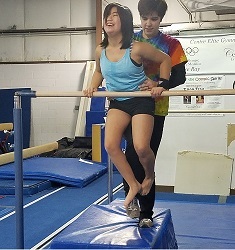 Special Olympics makes modifications for gymnasts with visual and hearing impairments, as well as modifications for athletes using canes or walkers. These modifications include coaching assistance, audible cues, and visual cues.